Judy Robertson, Korshed, Sharon Lia Robinson, Meherabad. I was fortunate to meet Korshed, one of Meher Baba’s inner circle, on my first and so far only visit to India, in the fall of 1995. Judy Robertson, a friend who was then residing part of each year at Meherabad, introduced me to her. 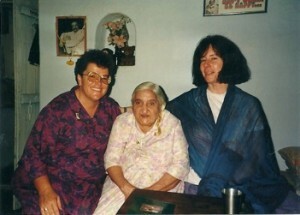 On several occasions during my two week stay as a pilgrim at Meherabad, I was invited by Judy to visit with Korshed. I recall that Korshed’s health was very fragile at the time. I had an experience there that is very valuable to me. I am a poet and I often feel that poetry may be helpful to people who have challenges in their lives. On one of my visits to her room, I began to read poetry to Korhsed and this seemed to be helpful to her, to somewhat revive her spirits. I recall that I was happy to see that she seemed to me to be enjoying the poems. I sensed subtle changes, and that she responded in a positive way. Today, in the United States, I have several friends who volunteer or are paid hospice workers. Inspired by my time reading for Korshed, I occasionally share with them the value of reading poetry to hospice patients. This information is always met with a positive response by the hospice friends I know. I sometimes share with my friends how I came to know of this idea, and thus I also may let them know of Meher Baba. The poems I read Korshed, as I recall, were from my devotional poem, Embracing You, and from the book Substance and Shadow by John Mijac. I had purchased several copies of his book during my visit as a pilgrim. Years later, when a close member of my family here in the United States was a hospice patient, I was able to send poetry books for the hospice and staff to read aloud to her. Again, I was motivated by the memory of reading to Korshed. I am grateful that I had the opportunity to read poems to Korshed. This experience, important in my life, gives me insights for sharing poems in many different and diverse settings. Also, I feel that the experience of reading aloud to Korshed gives me the endurance to continue to write poetry. I feel that I am also influenced on other levels by meeting her, which may be revealed to me in the future. Thanks to Judy Robertson, I was able to meet Korshed and spend time with her. I recall that I felt it was important to bring Korshed’s story to light for pilgrims and lovers of Meher Baba. Judy cared for Korshed and helped initiate this vision. Korshed is not as well known as other Mandali. Because of my own background, I always have a place in my heart when I feel someone is on the margins. From time to time during my stay in 1995, Judy introduced me to other residents, so I didn’t feel lost in a crowd. Being able to meet Bal Natu and some of the other Mandali, such as Arnavaz, Katie Irani, and Aloba is also significant and I may write more about my time there in the future. Jai Meher Baba!